Now you can have all your Bibles and Bible study reference materials available to you wherever you go. Whether its	a single favorite version or a complete Bible reference library, with Olive Tree Bible Software you can have it installed on your handheld PPC computer for quick reference or serious study. All these features make BibleReader a wise choice	for your handheld computer Bible software. Visit OliveTree.com for many more Bible study materials and eBooks for your BibleReader software! Split screen feature allows you to display up to six different windows on the screen at the same time. You can load them with three different Bibles for comparative reading, use one for a reference window to display dictionary and publisher notes in or use the whole screen to display a single text for easy continuous reading. BibleReader also includes Auto Scrolling which allows you to continuously read the text without having to tap on the scrolling button to make the text advance forward. The speed is adjustable for the particular user whether you desire slower or faster scrolling. Many of the texts we offer include hyperlinking to other valuable reference materials giving the user the ability to easily "dig" a little deeper in his study of the scriptures. Link to dictionaries, publisher notes and cross references that pertain to the hyperlinked word. Cross References are available for easily finding comparable texts. Highlighting, underlining and text bolding make it easy to mark those specific words or passages in the scripture that are outstanding to the individual reader. Topical Bookmarks allow you to create lists of your favorite verses. Personal Notes allows the user to create his own personal annotations for individual verses. Notes are stored and when the Personal Note icon is tapped on in the text the screen will split top and bottom displaying the users previously written note. Word and phrase search allows you to quickly find all the occurrences of a particular word or phrase in the Bible text or ebook that you are presently reading in. This valuable tool also allow you to set the perameters of your search to fine tune what you are looking for and where you want to find it. The results are returned to you as a list of verses with a sample phrase from the verse to help you select the specific text you want to read. Verse Chooser allows you to quickly navigate anywhere you want to go in the Bible. Three taps allow you to choose book, chapter and verse. Daily Reading schedules allow you to systematically read through the entire Bible over the course of a year and keep track of your progress as you do so. Bible Maps allow you to see the geographical context of the scriptures as they were at the time the scriptures were written. Original Languages, for those interested or having ability in the original languages of the Bible, Hebrew and Greek, we have the Hebrew Masoretic Text, Greek Septuagint, and Greek New Testament. 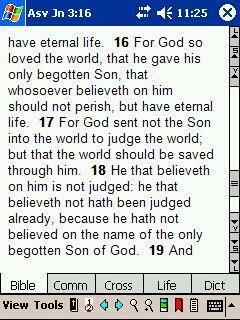 Read and search the Bible on your Smartphone!